My dog says today, November 1, is World Vegan Day! If you love animals, what better way to show that love than to stop eating them and quit using the products that exploit them. Not ready to go fully vegan? That's alright. Anything you can do to minimize animal cruelty and death is a step in the right direction. Can you say no to down pillows? Can you stop buying leather? 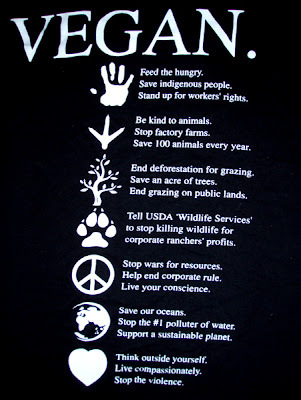 What about having a vegan or veggie meal once a week instead of a meat-based one? The animals will appreciate it and you will be living a more compassionate lifestyle that doesn't rely on the suffering of animals! Priscilla, you do indeed post some very yummy veggie meals on your blog! Thanks so much for giving people guidance in making great tasting, flesh-free dishes! My mom, Amber, retweets your Meatless Monday recipes when she sees them! Thanks for commenting, Priscilla, and kudos to you for eating vegetarian several times a week! 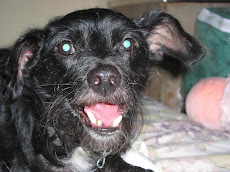 If you, or your companion animals, ever want to guest blog for My Dog Says, give my mom a shout. She fields all my correspondence and fan mail.